As some of you may have noticed, Doug Robbins and I will be alternating scribing this column. My role will be to draw your attention to articles and other publications available in the scientific literature. Not everyone has the time to spend checking this literature on a daily basis so my goal is to alert you to items that may be of interest to marine aquarists. Not all of you have access to university libraries so the procurement of some of this material might be difficult, but many of you can get access if you register as a public lender at your local university of college. There is also a lot of scientific literature that can be accessed through the Internet, so whenever possible, I will include links that will allow you to obtain or perhaps even view the material mentioned. In some cases I will review the publication while in others I will provide only the citation so that you can find it on your own. National Coral Reef Institute: Proceedings of the International Conference on Scientific Aspects of Coral Reef Assessment, Monitoring and Restoration. Bulletin of Marine Science 69(2):293-1060. In April of 1999, the National Coral Reef Institute held a three-day conference in Ft. Lauderdale, Florida, USA involving scientists and resource managers from around the world to address the scientific aspects of coral reef assessment, monitoring and restoration. This special issue of the Bulletin of Marine Science published in September 2001 represents a collection of 49 papers from this conference covering assessment of coral reefs (health, coral coverage, etc. 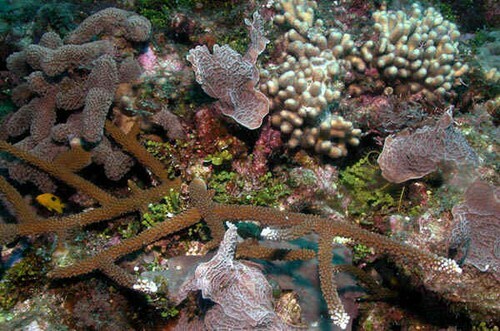 ), biodiversity and community dynamics, impacts and stressors, monitoring of coral reefs, and restoration efforts and techniques. The papers all incorporate at least one or more of three themes: What do researchers/managers perceive to be important needs and trends in these areas? What are the emerging issues and priorities for coral reef research, conservation and management? A stunning photo prominently featuring Acropora cervicornis. And what are the inadequacies in current programs/activities and action(s), modifications, or new approaches are needed to rectify these shortcomings? Coral reefs are often termed the “rainforests of the sea”, where the fish and corals represent the birds and trees. However, rainforest ecologists have found that it is the less conspicuous organisms of the rainforest, the insects, which have proven the most informative about the intricate ecological workings of these habitats. As of this time coral reef ecologists have yet to identify the aquatic equivalent of “insects”. There is now a growing consensus amongst coral reef ecologists that an analogous group of organisms may need to be identified on coral reefs (be they sponges, algae, crustaceans or tunicates) before they can begin to better understand the intricacies of coral reef ecology. Becker, L.C. and E. Mueller. The culture, transplantation and storage of Montastrea faveolata, Acropora cervicornis and Acropora palmata: What we have learned so far. Borneman, E. and J. Lowrie. Advances in captive husbandry and propagation: An easily utilized reef replenishment means from the private sector? Bowden-Kirby, A. Low-tech coral reef restoration methods modeled after natural fragmentation processes. Gleason, D.F., Brazeau, D.A. and D. Munfus. Methods to enhance sexual recruitment for restoration of damaged reefs. Spieler, R.E., Gilliam, D.S. and R.L. Sherman. Artificial substrate and coral reef restoration: What we need to know to know what we need. Ortiz-Prosper, A.L., Bowden-Kirby, A., Ruiz, H., Tirado, O., Caban, A., Sanchez, G. and J.C. Crespo. Planting small massive corals on small artificial concrete reefs or dead coral heads. 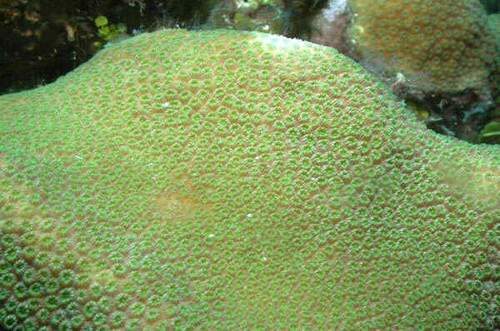 A large colony of Montastrea faveolata photographed in the wild. This special issue can be found in any university library that carries this journal, the call number is GC1.B8. You can also contact them via their website (http:// www.rsmas.miami.edu/bms) and obtain it as a back issue. Back issues are available for volumes 18 to present from the Bulletin of Marine Science, P.O. Box 971, Key Biscayne, Florida 33149-0971 USA. Most back issues are sold for $35.00 each and sent via surface mail. There is an additional charge for Air Mail depending on final destination. Prepayment in U.S. dollars is required. There are also table of contents available on their website for issues from November 1998 to March 2000. Invers, O., Zimmerman, R.C., Alberte, R.S., Perez, M. and J. Romero. 2001. Inorganic carbon sources for seagrass photosynthesis: an experimental evaluation of bicarbonate use in species inhabiting temperate waters. Journal of Experimental Marine Biology and Ecology 265(2):203-217. This is a rather interesting paper that details experiments in growing temperate species of seagrass from the Mediterranean (Posidonia oceanica and Cymodocea nodosa) and from the Monterey region of California (Zostera marina and Phyllospadix torreyi) under different pH, carbon dioxide and bicarbonate levels. It was found that at lower pH’s (5-6) the seagrass could photosynthesize at a greater rate due to larger amounts of CO2 being present. An increase in pH (8.2-8.6) causes a decrease in photosynthesis due to less CO2 being present; at this point bicarbonate (HCO3–) becomes the main source of inorganic carbon. As a result, a higher pH results in lower rates of photosynthesis, as bicarbonate becomes the limiting factor. Interestingly, it was found that at a similar pH the Mediterranean species were better able to use bicarbonate than the Monterey species, while the Monterey species were better at using carbon dioxide. The key point to take home here is the importance of maintaining bicarbonate alkalinity, especially if you are interested in keeping seagrass and macroalgae. Buffers that contain high levels of borate at the expense of bicarbonates and carbonates should be avoided for obvious reasons. Mizrahi, O.L., Chadwick-Furman, N.E. and Y. Achituv. 2001. Factors controlling the expansion behavior of Favia favus (Cnidaria: Scleractinia): Effects of light, flow and planktonic prey. Biological Bulletin 200(April):118-126. It is a common belief that corals expand at night in order to feed on planktonic prey. However, what is forgotten is that water flow and light levels also play an important role. This paper describes a study conducted in the Red Sea on Favia favus, a massive coral who’s polyps open soon after sunset and retract just after dawn. Their results indicate that three factors: flow rate (low= 5 cm/s, medium = 10 cm/s, high = 15 cm/s), light level (low = 40 umol/m/s2, medium = 80 umol/m/s2, high = 120 umol/m/s2) and prey presence (Artemia nauplii), determine the degree of polyp extension at night, but flow rate and light are the main triggers. Tentacle expansion was greatest when water flow was high, light levels were low and prey was present. When no prey was present extension was only 75%. In still water the corals would not extend their tentacles even if light levels and prey density were varied. When light levels are too high (above the light compensation point of 107 +/-24 umol/m/s2) the coral would not expand no matter what the flow was or if prey was present. If no prey was present, and the flow was medium or high, and light was below the light compensation point, then the corals still expanded, indicating that the coral’s response to the presence of prey was secondary to water flow and light level. The authors also concluded that since the zooxanthellae density in this species is low, extending the tentacles during the day was probably metabolically more expensive than keeping them closed. They felt that their results may not be applicable to corals with high densities of zooxanthellae and that these corals would be more likely to benefit from expanding during the daytime. For the aquarist the lesson here is that flow rates need also be taken into consideration when it comes to determining feeding in corals at night. Too low a flow may result in some corals not expanding and hence, not being able to feed. This lack of polyp tentacle extension could be mistakenly interpreted as sign that the coral does not need to or want to feed. The following are citations for articles that might also be of interest to aquarists, which were published in the latter months of 2001. Duh, C.Y., Chen, K.J., ElGamal, A.A.H. and C.F. Dai. 2001. Sesquiterpenes from the formosan stolonifer Tubipora musica. Journal of Natural Products 64(4):1430-1433.Fitt, W.K. and C.B. Cook. 2001. The effects of feeding or addition of dissolved inorganic nutrients in maintaining the symbiosis between dinoflagellates and a tropical marine cnidarian. Marine Biology 139:507-517. Watanabe, M., Sekine, M., Takahashi, H and K. Iguchi. 2001. New halogenated marine prostanoids with cytotoxic activity from the Okinawan soft coral Clavularia viridis. Journal of Natural Products 64(4):1421-1425. Amirsardari, Y., Yu, O. and P. Williams. 2001. Effect of ozone and UV irradiation with direct filtration on disinfection and disinfection by-product precursors in drinking water. Environmental Technology 22(9):1015-1024. Chan, T.C., Ormand, R.F.G. and Mok, H-K. 2001. Feeding and territorial behaviour in juveniles of three co-existing triggerfishes. Journal of Fish Biology 59(5):524-532.Crossman, D.J., Choat, J.H., Clements, K.D., Hardy, T. and J. McConochie. 2001. Detritus as food for grazing fishes on coral reefs. Limnology and Oceanography 46(7):1596-1605.Randall, J.E. 2001. Four new cardinalfishs (Perciformes: Apogonidae) from the Marquesas Islands. Pacific Science 55(1):47-64.Randall, J.E. 2001. Antennatus linearis, a new Indo-Pacific species of frogfish (Lophiiformes: Antennariiidae). Pacific Science 55(2):137-144. Tanaka, Y., Hioki, S. and K. Suzuki. 2001. Spawning behavior, eggs, and larvae of the butterflyfish, Chaetodon modestus in an aquarium. Journal of the School of Marine Science and Technology Tokai University No. 51:89-100. (In Japanese with English abstract and figure captions). Bauer, R.T. 2000. Simultaneous hermaphroditism in caridean shrimps: a unique and puzzling sexual system in the decapoda. Journal of Crustacean Biology 20:116-128.Bauer, R.T. and G.J. Holt. 1998. Simultaneous hermaphroditism in the marine shrimp Lysmata wurdemanni (Caridea: Hippolytidae): an undescribed sexual system in the decapod Crustacea. Marine Biology 132:223-235.Fielder, G.C. 1998. Functional, simultaneous hermaphroditism in female-phase Lysmata amboinensis (Decapoda: Caridea: Hippolytidae). Pacific Science 52:161-169.Lin, J. and D. Zhang. 2001. Reproduction in a simultaneous hermaphroditic shrimp Lysmata wurdemanni: any two will do? Marine Biology 139:919-922. Zhang, D., Lin, J. and R.L. Creswell. 1998. Effects of food and temperature on survival and development in the peppermint shrimp Lysmata wurdemanni. Journal of the World Aquacultural Society 29:471-476. A very interesting website is the Hawaii Sea Grant program. On this site you can find pages that allow you to search their list of publications (many of which are free) ( http://imina.soest.hawaii.edu/SEAGRANT/publications.html) as well as a bibliographic listing of articles published in journals, conference/symposium proceedings, and other publications, as are titles of reports produced in cooperation with other organizations ( http://imina.soest.hawaii.edu/SEAGRANT/bibliography.html). There is also an interesting list of articles, each of which you can read online, dealing with aquaculture of marine and freshwater fish including rearing certain fish and live feeds ( http://www.soest.hawaii.edu/SEAGRANT/aquacultips.html).